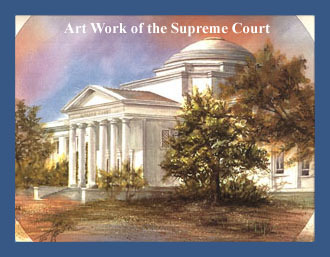 Like many State buildings in Tallahassee, the Florida Supreme Court has a significant collection of original artwork. Virtually all of it was created by artists who had substantial connections to the State of Florida, as befits a governmental building in the capital city. Perhaps the most striking pieces of art are the two large copper eagles placed in niches in the rotunda area. These sculptures were created by an internationally renowned artist who maintained his studio in Panama City, Florida. The artist, Roland Hockett, was commissioned to do the work in the late 1980s as the Court's most recent renovations were being completed. The eagles are done in a stylized freeform meant to symbolize not merely eagles, but also the ideals many people associate with our national emblem. Mr. Hockett himself explained this concept. "The eagle as the official symbol for the country," he said, "represents strength and freedom. I chose the eagle as the basis for inventing my own rhythmic movements to suggest freedom. If people are looking for claws on the eagles, they won't see them. If they're looking for feathers, they may think they see feathers, but what they'll really see is a repetition of rhythmic forms based on an eagle's feathers." During the process of creating the sculpture, Hockett made a conscious effort to match the eagles to their intended surroundings. Thus, the copper has green verdigris that blends with the green columns in the rotunda itself. Behind the sculptures are small round pieces in which lie golden discs. These, of course, symbolize the sun rising over the representation of American freedom. This theme is further underscored by a large plaque to the immediate left of the rotunda, on which is inscribed the Bill of Rights. It is perhaps worth noting that Mr. Hockett -- like any artist -- has left his name for posterity on his creations. If viewers look closely at the lower parts of the sculptures, they can see Mr. Hockett's name welded into lower forms that represent the "feathers." Inside the Clerk's Office, the Court maintains a lawyers' lounge for the use of attorneys awaiting oral arguments. The lounge was completely renovated shortly after the 1990 remodeling of the entire building was completed. However, no taxpayers' money was used. Instead, lawyers from around the State donated funds to complete the changes, to purchase furnishings, and to buy accessories. The chandeliers, however, originally were hanging in the Governor's office. They were removed during renovations of the Capitol and given to the Court. By tradition, the portraits hung in the lawyers' lounge are those of sitting Justices or of Senior (retired) Justices who still are working at the Court on official business. The portraits in the lawyers' lounge eventually will be moved into the official Portrait Gallery after each Justice leaves the Court. An unusual bit of historical art also is located in the lawyers' lounge. In one corner stands large black objects taken from Florida's first Supreme Court building after its demolition in 1979. These are newel posts from the building's grand staircase. The Supreme Court had moved out of this building in 1949, after which time the structure was used to house other State agencies including the Railroad Commission and its successor agencies. Other pieces of art also are on display in the Supreme Court Library. 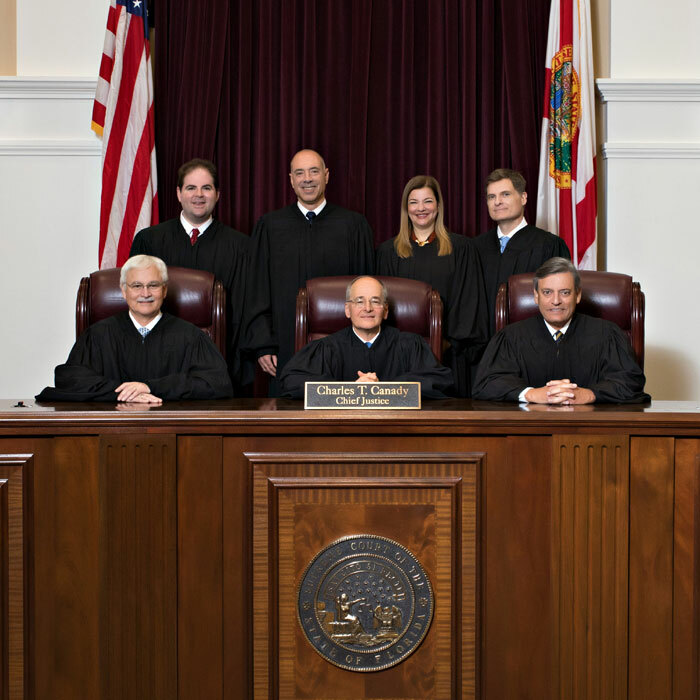 In the entranceway into the Library are portraits of Florida Supreme Court Commissioners, a group that no longer exists. On display in the Library's glass case are several of the rarest books owned by the Court as well as memorabilia of Justice J.B. Whitfield.